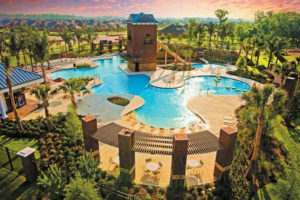 Hundreds were in attendance at an invitation-only ceremonial groundbreaking and preview party for a 70-acre mixed-use entertainment destination in Lago Mar, a Land Tejas master-planned community in Texas City, Tex. The resort complex will feature a 12-acre crystal clear lagoon — the largest in Texas and the first to offer public access. Lago Mar residents, local officials, project team members and others learned details of the Crystal Lagoons® amenity and surrounding development during the event before enjoying a concert by country music star Tracy Byrd. A large portion of the lagoon will be designed for resident access and framed by private white sand beaches and a clubhouse. The other portion of the lagoon is being designed for public access and will have multiple beaches, a floating obstacle course, a swim-up bar, a 10,000-square-foot beach club with cabana pool and the Treasure Island complex with a two-story building that can host corporate and other events. Tortuga Beach will be the largest beach on the lagoon and will be able to accommodate approximately 2,000 people per day. The Breezeway Boardwalk is expected to have more than 30 restaurants and entertainment destinations. Other features of the complex include a possible hotel, a sailing facility, a paddleboard and kayaking launch and a celebration lawn. Condominiums and townhomes are also planned for the 70-acre resort complex. Approximately 250,000 square feet of restaurant and retail space will be available. Actual construction of the lagoon complex has begun and the first phase of construction is expected to be complete by 2020. Trez Capital’s Dallas office is financing construction of the lagoon. The Lago Mar lagoon will be up to 10 feet deep. Like the Balmoral lagoon — which is the first to open in Texas and also built by Land Tejas — the Lago Mar amenity will employ Crystal Lagoons’ patented, environmentally friendly technology. The high-tech process allows lagoons to maintain its turquoise waters with 100 times fewer chemicals and 50 times less energy than a traditional pool. In addition to Crystal Lagoons Corp., Land Tejas is working with Heidt Design, LLC, from Tampa, Fla.; Houston-based KGA/Deforest Design LLC; Kimley-Horn planning and design engineering consultants; Iowa-based event management company VenuWorks; and Jones Carter in The Woodlands to develop plans for the lagoon. Lago Mar is a 2,033-acre community located along Interstate 45 in Texas City just 14 miles north of Galveston. More than 4,000 homes are planned for the community, and home prices start in the $200,000s. Current commercial real estate offerings in Lago Mar include Tanger Outlets and Buc-ee’s Travel Center. Information about Lago Mar is available at www.lagomarintexascity.com. For more information about commercial development opportunities in and around the 70-acre mixed use destination in Lago Mar, please visit www.landtejas.com.